While putting together the interviews this month I was more than a bit pleased to learn how many of the participating poets are former classroom teachers. That bit of knowledge just warms my heart. Avis Harley is one of these special people. I found my way to Avis' work while trying to work on my own writing. I found that adult books on writing poetry weren't helping me experiment and practice with poetic forms, so I began to look for books written for kids on how to write poetry. Enter Avis Harley and the book Fly With Poetry: An ABC of Poetry. When I found this book just after my son was born (2001), I was thrilled. Not only did it provide basic information on different forms, it included fine examples and gave me some terrific models. This was Avis' first book of poetry and she not only wrote it, but illustrated it as well. Her second book, Leap Into Poetry: More ABCs of Poetry, followed closely on its heels and demonstrates both poetic forms and literary terms. Before I go on and talk more about Avis' writing, let's learn a bit more about her. Avis: I have always loved playing with words. I kept diaries (with a lock and key!) and wrote poems from a very young age, but during my final year in high school I took a creative writing course. We were exposed to different kinds of poetry – and I was thrilled to discover the variety of forms available, and how poets could turn the ordinary into the extraordinary. I wrote a lot of poetry in that class, and realized it was something very important to me. I remember my surprise and delight in winning a poetry contest that year, and having the poem published in an anthology. Avis: Thinking about things around me, and how I might capture these thoughts. Also, I listened to a lot of poetry in my early years. I heard traditional nursery rhymes recited by my grandmother, who was a very animated speaker, and my mother read the A. A. Milne series. My mother was a great fan of Robert Louis Stevenson, and one of my favorite books was A Child’s Garden of Verses. She read me those poems over and over, and I still have that well-loved, timeworn copy on my book shelf. Stevenson wrote this book almost exclusively in quatrains, using iambic tetrameter. This seemed to have influenced my initial attempts at creating verse, as my early poems all seemed to follow this pattern. Avis: I think my love of children’s poetry grew out of my love of working with children. I had my first class of Grade 3 students when I was nineteen, and I’ve been listening to the language of children ever since. Sharing with students the wonderful variety and wealth of poetry available is always an enriching experience. I also have had the pleasure of teaching children’s poetry at the university level, working with teachers and librarians on ways to integrate it into all areas of the curriculum – reading and sharing poetry, tasting the joy of making poems – with some students finding their poetic voices for the first time. Avis: I don’t believe my academic background gave me too much in the way of formal training in poetry writing. I just always wrote on my own. Reading is something that’s always been part of my daily life. As a child, I think I enjoyed descriptive passages more than plot in the stories that I read, and I’ve always been drawn to the rich imagery found in poetry. I love the challenge of arranging words. I am never without a pen and a scrap of paper. An image or line can pop into my head and pop out just as quickly. Ideas need to be recorded quickly, for fear they might disappear. And laughter of pebbles teasing the shore. I connect up with Neptune on shellular phone. I’ll look it up next week! Avis: That’s a difficult question. 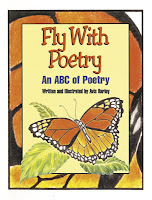 Sometimes I think my first poetry book: Fly With Poetry: An ABC of Poetry is my favorite because there is something special about your first published book. The Monarch’s Progress: Poems with Wings is very important to me. I have such respect and admiration for the monarch butterfly; I loved writing and illustrating that book. 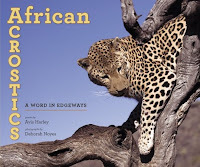 I have a new book coming out in 2009 entitled African Acrostics: A Word in Edgeways, published by Candlewick. I set myself new challenges in this book by creating acrostics I have not seen done before, including the multiple one. It was great fun to create an armchair safari! Avis: I have just finished writing and illustrating a book about the honeybee – another tiny creature who fascinates me. Maybe this is my favorite book! It is a combination of poetry and science. Honeybee Poetry is now buzzing around looking for a publisher. Your favorite place to write and illustrate? Avis: I like to sit at my desk beside a large window. There is an overflowing flowerbox on the ledge, and just above the flowers is a hummingbird feeder. A tray of birdseed hangs nearby, and proves to be a constant challenge to the squirrels. It’s a very busy spot! Avis: J. Patrick Lewis: a Master of Words, Wit, and Wisdom. Avis' most recent book, The Monarch’s Progress: Poems with Wings, was a 2008 Cybils nominee in the poetry category. This spring when my son's class studies the life cycle of butterflies, it will be THE book I give to his teacher. Using a variety of poetic forms, including alphabet poems, acrostics, cinquains, haiku, limericks, sonnets and more, readers will learn a whole lot of science while enjoying these poems. In the introduction, Avis explains why she chose specific forms for certain poems. In the back matter is a section entitled Small Matters. In it readers will find additional information about the content of the poems and illustrations. Boy do I wish I had this book in my classroom library when I was teaching! In addition to her poetry collections, Avis' work also appears in a number of anthologies. One of my favorite poems appears in Hoofbeats, Claws & Rippled Fins: Creature Poems, selected by Lee Bennett Hopkins and illustrated by Stephen Alcorn. I have a thing for turtles anyway, but this poem just sings to me. in this great enduring race. Avis Harley may not be in the classroom any longer, but she's not far from that work, teaching all her readers through her poetry. I hope you've enjoyed learning more about Avis and her work. Keep your eyes open for her new book and let's hope there will be lots more her in the very near future. A hearty thanks goes out to Avis for joining us in the Poetry Makers series. All poems ©Avis Harley. All rights reserved. What a fantastic interview, Tricia. I am a HUGE fan of Monarch's Progress. I think it's just a gem! I can't wait to read African Acrostics. Acrostics are one of my favorite forms to both read and write, and she had lovely ones in Monarch's Progress. It was terrific to learn more about Avis. Thank you, both of you! I love writing acrostics -- or what are kind of acrostics. She writes more cleverly than that. Neat stuff. Avis is a poet I wasn't familiar with. I love reading about poets who were former teachers. I can't wait to look at her website. I love reading these interviews. I've been really struck by the connection between SCIENCE and POETRY. Hmmm. I can't wait for the new book of acrostics! Also, HOORAY for teachers-turned-poets!!! Now I know what I want to be when I grow up the NEXT time!! Tricia, I love the idea of learning how to write poetry using books for kids instead of books for adults. I should try that. :o) I wish I had Fly With Poetry: An ABC of Poetry! Ekphrastic April 2019, Day 22: "Salem Willows"